suggestive of the past, suggestive of the Florida that is slipping away from us so fast. road; but for us, it's just the beginning. strangers come only by accident. times in Melrose, we imagine that we commune with the butterfly. seeing people mess the state up for short-term gain. itself. We want to always be able to see, feel, and taste the real thing. We appeal to you to all Floridians to keep Florida in the forefront of their consciences. and identity and reaffirm the individual dimensions of our lives, the true things of Florida. and digesting Florida and then turning it into something less attractive. couple of cities to Florida every year for 60 years. quote from Alice in Wonderland, when you don't know where you're going, any road will do. customs belong to genuine Floridians. In today's Florida oldtimers often feel as alien as newcomers. understandable if sometimes we feel we are under siege. need to talk about things not measurable by numbers memory, appreciation, and mystique. enjoyed if left natural, but easily destroyed if too closely captured. along. They just didn't recognize it. It was not a single place that restored youth, as they had hoped. that every day create new beginnings and new capacities for life. Florida are more vulnerable than ever because population growth forces difficult decisions about them. political compromises. But we have reached a time now when we are being compromised to death. wetlands, every natural vista, every natural treasure is in some way threatened or outright spoiled. What a waste. What incredible damage to an enduring Florida economy. food because we think it will create a better life and a more secure future that is our thinking." loose in the world that passes for reason," he said. business-like and sane. Only his purposes were mad. Such madness is not just the stuff of novels. Look around you in Florida. judged against itself, by its own standards and its own natural treasures and by its own past. the kinds of things you might think about when it's midnight and you're still trying to go to sleep. As T.S. of those dead geraniums for you. spooked mullet would jump right in the boat. stand and drink all the orange juice you could hold for a dime? Springs looked more like Wakulla Springs, or when Sanibel Island looked a little like Dog Island. large they would create a minor eclipse of the sun. could be bought for $25 down and $10 a month, and few takers. a dinner there today, or when Destin was a long, unbroken stretch of dunes, mile after mile. Floridians can only board up, pray and hope. and we could shower as long as we wanted, and we could water our lawns anytime we chose. the rains didn't bring floods, and droughts didn't guarantee wildfires. beach and make a tasty soup. water itself might be hazardous. recognize the names of all the fish, and you knew that they came out of Florida waters. almost everything we love about Florida has been put at risk. 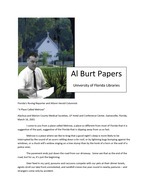 2011 University of Florida George A. Smathers Libraries. Acceptable Use, Copyright, and Disclaimer Statement. In Melrose, we agree with Hawthorne, who wrote that happi ness is like a butterfly. If you pursue it, it will fly away. B ut if you will sit down quietly, it might alight on you I n the best of our quiet times in Melrose, we imagine that we commune with the butterfly. This is all personal. I am retired now, and I don't represent any one except maybe the everyday Floridian T he Floridian who has no special axe to grind, and no bu siness to promote. The Floridian who sees Florida simply as h ome, not a business opportunity T he Floridian who is tired of seeing people mess the s tate up for short term gain. We everyday folk think that Florida faces one issue that over rides all other s: how to accommodate growth wit hout being stupid about it, h ow to let growth provide an engine witho ut taking over the steering. We just want Florida to remain Florida, and not turn into some chintzy imitation of itself We want to always be able t o see feel, and taste the real thing. E verything else follows that. We appeal to you to all Floridians to keep Florida in the forefront of their consciences Remember Florida when you vote, when you donate money, when you lobby, when you talk with friends, w hen you expose yourself to the hazards of politics and politicians K eep in mind the health of Florida. We common folk occur all over Florida almost anywhere and everywher e like weeds and wildflowers and make a statement by our presence. We stir t he memory, provoke the conscience, and sometimes agitate th e Babbits. We see Florida as a place struggling to stay true to itself, struggling to maintain an honest identity. We like luxuries and convenienc es too, like everybody else, but we think it is po ssib le to pay too much for them. Sometimes, we think that what we are getting in Florida is not as good as what we are losing. We are people who find significance not only in headlines, and beauty not only in broad vistas and colorful horizons but also i n the small things of Florida the sights and sounds and smells that we grew up with t he things of home that are blooded and boned into our beings that represent heritage and identity and reaffirm the individual dimensions of our live s, the true things o f Florida. In Florida the facts and the science tell a powerful story They accent the Florida dilemma. It is a tale of the many who so love this extraordinary place that they stampede here branding it with their initials, shaping it with their customs, blocking it out for shopping mall convenience tasting and feeling and digesting Florida and then turning it into something less attractive The numbers are staggering. In 1940 Florida had fewer than 2 million residents; now i t has more than 15 million and a high percentage of that growth bypassed the stork ; it came through migration. s an average net gain of more than 200,000 new residents per year ike adding a couple of cities to Florida every year for 60 years. hazy, the water to taste funny We accept declining performance as the norm and as Floridians we cannot afford that. We need to take special care to remember what has h appened, wha t we have lost. We owe to future generations not to waste the dead eye accuracy of hindsight We need t hose lessons for the future. And finally, closer to home, I quote another of my favorite authors from a current book, The Tropic of Cracker It goes this way: The beginning of the next Florida is in sight .... The future is happening now .... [But] whether that next Florida will evolve as a true descendant of the old one [has become] a matter now [only] for 2011 University of Florida George A. Smathers Libraries. All rights reserved. Acceptable Use, Copyright, and Disclaimer Statement.